Alright, we've focused on accessories this week, so let's bring it back to the clothes. I love a great cardigan, especially this time of year when layering is key in between seasons. We've looked at sheer cardis, patterned cardis, today let's look at striped cardigans. I love the pops of lime in this sweater. You can also choose from red/navy or pink/white. This is just waiting for some colorful accessories. Maybe a tangerine lip?! This is great for weekends or for travel. I love the pops of yellow. Madewell got it right here, leave this cardi open to show the pop of pink. A great vneck is great to leave a cardigan open as well. 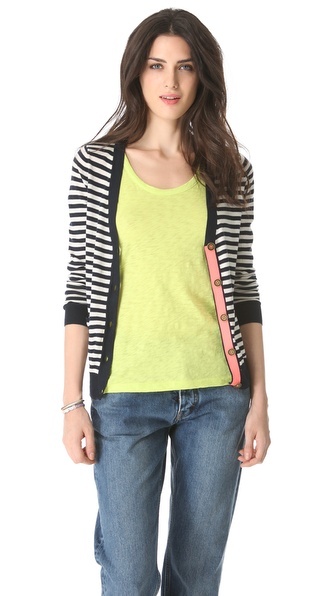 Striped cardigans are a great and easy way to mix pattern into your outfit, and they're never going out of style. You can also layer these cardigans on top of a solid dress.